Fr. Cliff Hennings, OFM, collects ballots at the Extrordinary Chapter. 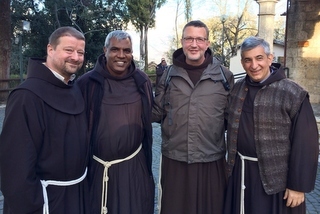 15-27: Mark Soehner attends “Provincials’ School”, the annual meeting of the Minister General and Definitory with newly elected Provincial Ministers and Custodes at the General Curia in Rome. 18: In SJB News Notes, Michael Radomski writes about the re-formation of the Brothers’ Work Crew in Detroit. They’re still looking for a place to house their tools. 23-30: New Pastor Jeff Scheeler holds “listening sessions” at Transfiguration Parish in Southfield, Mich., with more than 77 parishioners. Jan. 28-Feb. 3: Schools around the province celebrate Catholic Schools Week. 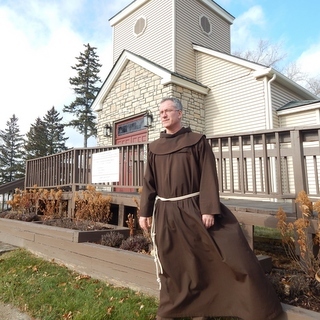 Jan. 29, Roger Bacon students wear brown shirts to celebrate their Franciscan heritage. Jan. 29-Feb. 1: Provincial Council meets in New Orleans, La. 14: As Lent begins, friars join in prayer and sorrow following the killing of 17 high school students in a mass shooting in Parkland, Fla. Survivors push for gun reform. 23: Clifford Hennings and UC college students take part in a “poverty simulation” coordinated by St. Vincent de Paul in Cincinnati. 27: The Center for Respite Care welcomes friends and donors to its new home at the St. Anthony Center in Over-the-Rhine. Provincial Vicar Bill Farris accepts a recognition for the Province’s help in that process. Fr. 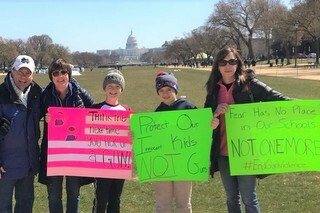 Henry Beck and friends marching for gun reform. 1-4: Provincial Council meets in Cincinnati. 7: Sr. Mary Pia Malaborbor, OSC, is elected the new abbess of the Cincinnati Poor Clares. Sr. Anna Marie Covely is Vicaress. Sr. Vickie Griner is Councilor. 12: Conrad Rebmann dies at the age of 93. 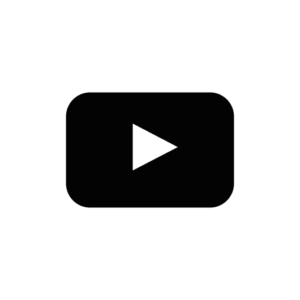 15: Richard Goodin is featured in a video by NBC Left Field on millennials joining religious life. 24: Henry Beck takes part in the March for Our Lives rally in Washington, D.C., to promote responsible gun laws in response to the Parkland shootings. 27-28: Mark Soehner receives the temporary vows of Eric Seguin in Toronto, Canada. 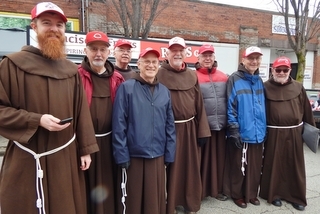 Friars in the Reds Opening Day parade. 2: Ten friars brave the cold to walk and ride in the Findlay Market Reds Opening Day Parade in Cincinnati. 5-13: Mark Soehner, Dan Anderson and Pat McCloskey travel to London for the ESC meeting. 12: In Chicago, Bill Farris renews the vows of the temporary professed, including John Boissy from SJB Province. 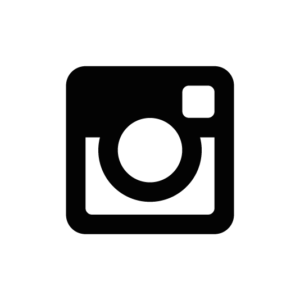 22-25: Provincial Council meets in Chicago. 27: Friars Club hosts its 46th Community Dinner in Cincinnati. Philanthropic restaurateur Dean Gregory receives the Francis Award; football standout Troy Tuck accepts the Friars Award; Xavier’s Trevon Bluiett is Player of the Year. 2-3: At St. Francis Retreat Center in Easton, Pa., Bethlehem Twp. police and Freedom High School hold a retreat to teach students the dangers of texting and driving. 4: Warren Zeisler dies at the age of 94. 20-26: Postulants Raphael Ozoude and Matt Ryan spend an “immersion” week of ministry in Jamaica. 28-31: Provincial Council meets in Cincinnati. 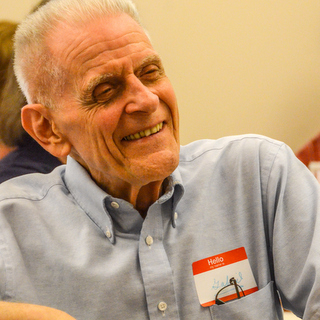 29: The province celebrates 22 jubilarians at St. Monica-St. George Parish in Cincinnati. Among them is Cyprian Berens, marking 75 years as a friar. 30: SJB friars vote 86 to 9 in favor of U.S. restructuring at a historic Extraordinary Chapter at Roger Bacon High School in Cincinnati. Simultaneously, five other provinces approve the proposal to form one new entity. Unification is projected to happen by 2023. 1: The first issue of St. Anthony Messenger magazine was published 125 years ago on this date, a milestone observed in a retrospective issue in May. 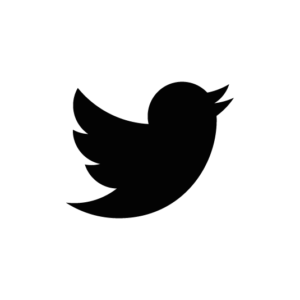 12-28: SJB friars follow daily reports from the Plenary Council of the Order, meeting in Nairobi, Kenya. Participants develop priorities listening to those in small-group “World Café” settings. 13: The annual celebration of the Feast of St. Anthony at St. Anthony Friary in Mt. Airy draws large crowds, including busloads of Chaldean Catholics from the Detroit area. 18: St. Monica-St. George Parish is recognized as a Laudato Si’ Community by the Archdiocese of Cincinnati for its efforts to conserve energy and reduce its carbon footprint. 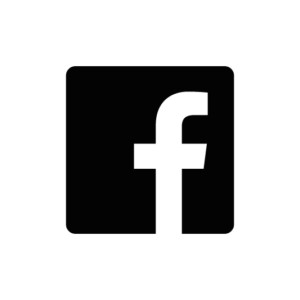 18-20: Provincial Council meets in Cincinnati with Sponsored Ministries. 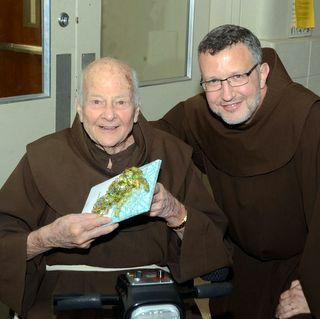 21-24: Gabriel Balassone receives the Christian Life Award and Al Hirt receives the Humanitarian Award during the Franciscan Alumni Association reunion at the former St. Francis Seminary in Cincinnati. 24: Bill Farris and Tim Lamb represent the province at the first Festival of Faiths at Xavier’s Cintas Center in Cincinnati. 1: Mike Chowning and Mike Dubec celebrate their golden jubilees in Hazard, Ky., at our former parish of Mother of Good Counsel. 1-7: Mark Soehner, Pat McCloskey, Frank Jasper, Carl Langenderfer and Richard Goodin attend the ESC Formation Conference in Wappingers Falls, N.Y.
5: Stephen DuPuis from ABVM Province joins SJB’s missionary friars in Negril, Jamaica. 16: Mark Soehner is among provincials present for the reception of 12 novices at Old Mission Santa Barbara in Santa Barbara, Calif., where SJB’s Matt Ryan and Raphael Ozoude are received into the Order. 28: Parishioners and friars from St. Mary of the Angels in New Orleans join friends from St. Pius X to serve 150 homeless and hungry guests at the St. Jude Community Center in the French Quarter. July 30-Aug. 1: At a CMSM meeting in St. Louis, Richard Goodin and Mark Soehner hear about the climate for vocations in the Church. 5: Several hundred gather for a performance by the Original Vandellas as well as free hot dogs, soda and ice cream at the annual Block Party hosted by St. Aloysius Parish in Detroit. 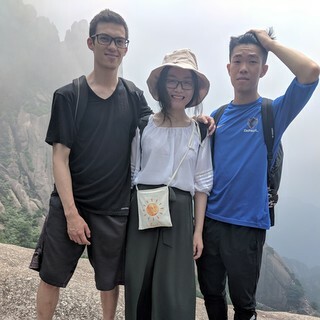 6: John Boissy returns to the U.S. after a summer studying the Mandarin language in China in a program arranged through DePaul University. 7-10: Richard Goodin, Roger Lopez, Clifford Hennings, Michael Charron and Colin King are among 36 friars from seven U.S. provinces attending the Solemnly Professed Under Ten Years (SPUTY) gathering at Holy Name College in Silver Spring, Md. 14: David Moczulski dies at the age of 62. 20-24: SJB’s Provincial Council joins councils from the other US-6 provinces in St. Louis for their first meeting following May’s historic vote on restructuring. 30: SJB’s Joshua Richter enters the postulancy program in Silver Spring, Md., with 11 others from US-6 provinces. 8: Andre McGrath dies at the age of 78. 8: Detroit-area friars attend grand re-opening of the Chapel of St. Joseph and the Shrine of the Immaculate Heart of Mary in Pontiac, Mich., new home of Terra Sancta Pilgrimages, co-founded by Alex Kratz. 11-12: Animators of US-6 JPIC meet at St. Anthony Friary, Mt. Airy, to plan unification. 17-20: SJB’s Luis Aponte-Merced attends Juntos Como Hermanos meeting in Washington, D.C.
25-30: Provincial Council meets at St. Francis Retreat House in Easton, Pa.
30: Detroit-area friars host a Come and See dinner at Transfiguration Friary. 3: Friars gather for Transitus, observed in the Cincinnati area at St. Clement and in the Detroit area at Transfiguration. 4: St. Francis Seraph in Cincinnati hosts area friars, Poor Clares and the Dominicans for evening prayer on the Feast of St. Francis. Earlier that day, Sr. Luisa Bayate, OSC, is sworn in as an American citizen. 6-12: English Speaking Conference of Provincials meets in St. Louis. Friars Matt Ryan and Raphael Ozoude receive their habits. 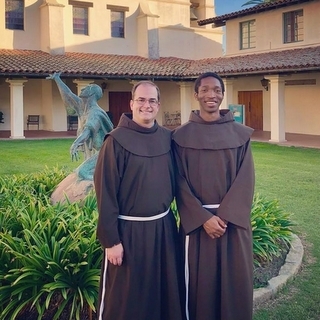 16: Raphael Ozoude and Matt Ryan receive their novice habits at Old Mission Santa Barbara in California. 17: Jaye Capobianco and Sr. Regina Rokosny, OSF, are presented with a Francis Medal for faithful service to the friars and St. Francis Retreat House in Easton, Pa.
19-21: Come and See Weekend held at St. Anthony Friary in Mt. Airy. 21-23: Pat McCloskey and Mark Soehner are among ESC friars attending the Celebration of Union of the two Canadian provinces in St. Albert, Alberta. 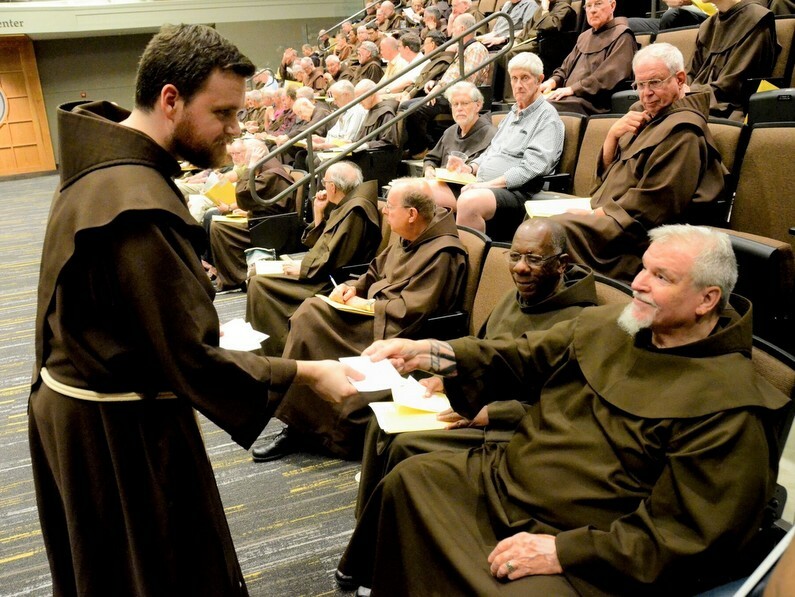 25-27: CTU provides a space for the Duns Scotus Symposium for Franciscan formator friars of all branches of the First Order, as well as many Third Order communities and new communities. 28: Largest number of prospective students in five years attend Roger Bacon’s annual Open House in Cincinnati. 4-9: Provincial Council meets at Clifty Falls and in its letter spells out its plan for revitalization and restructuring of our province. Fr. 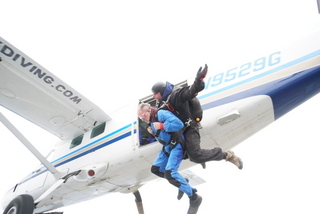 Tom Speier takes his first parachute jump. 4: Tom Speier, 86, makes his first parachute jump at Middletown [Ohio] Regional Airport. 16: News Notes commemorates the 1918 Armistice ending World War I and the 100th anniversary of the death of SJB friar Placid H. Doyle, who died in France while serving as an Army chaplain. Nov. 23-Jan. 6: St. Francis Seraph Church hosts a Live Nativity in the courtyard, and Tim Sucher orchestrates a Franciscan Christmas (Nov. 25-Dec. 30) at Christian Moerlein in Over-the-Rhine. 25: Yvonne Forrest, longtime cook and housekeeper, receives the Francis Medal for faithful service at Mary, Gate of Heaven in Negril, Jamaica. 10-13: Provincial Council meets in Cincinnati. 12: One-year anniversary of St. Anthony Center in Over-the-Rhine is observed with a News Notes report (Dec. 11) on its impact in the community. 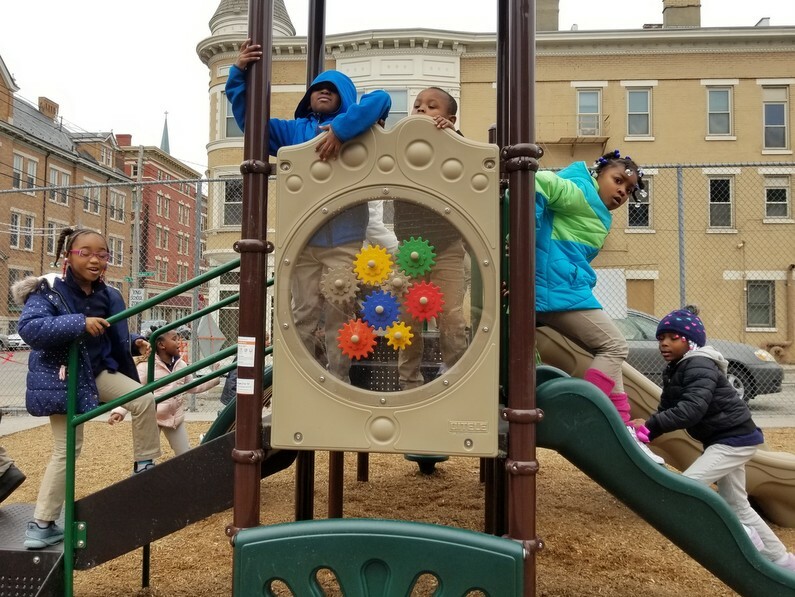 13: Playground equipment is unveiled at St. Francis Seraph School in Over-the-Rhine, made possible by donations from JACK Casino and others. Students enjoy the new playground equipment at St. Francis Seraph Elementary.